Numeracy is different to Mathematics. 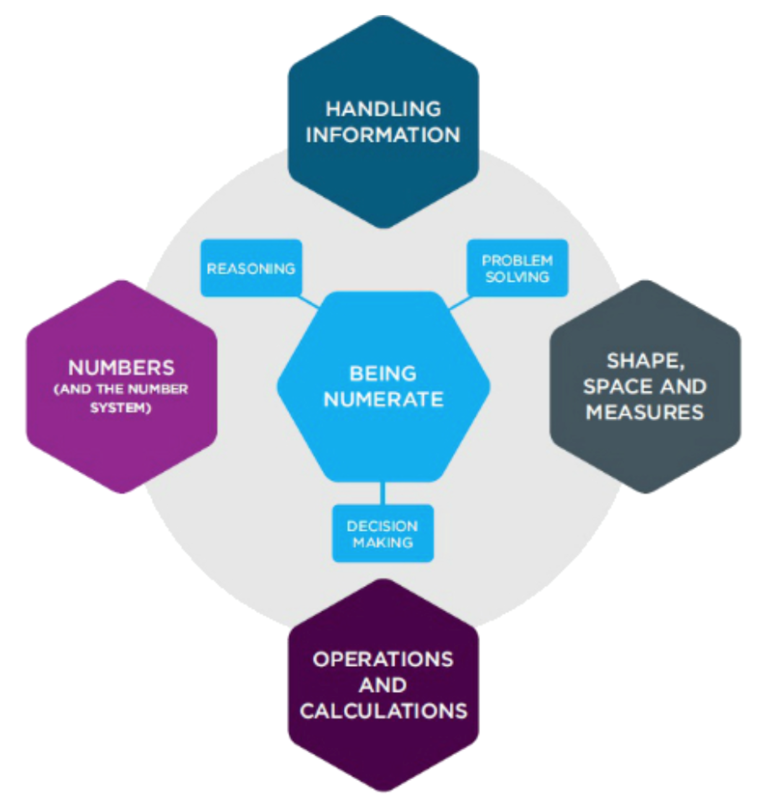 Summerhill students learn most of their numeracy skills in their mathematics lessons but being numerate means they are able to apply these skills in both mathematics and all of their other subjects. It is having the confidence and skill to use numbers and mathematical approaches in all aspects of life - at work, in practical everyday activities at home and beyond, in managing our finances, as parents helping children learn, as patients making sense of health information, as citizens understanding the world around us. A detailed presentation explaining the core mathematical skills that we all need to be confident and competent with numbers in daily life and the workplace can be found here. At Summerhill School, we believe that that Numeracy is not the sole responsibility of the mathematics department. All other subjects contribute to the development and enhancement of students’ numeracy skills including their ability to describe and explain their strategies and reasoning. Numeracy and Literacy are essential skills for academic success and to cope with the challenges that life brings. As such, we look for opportunities to develop these skills and join up teaching, learning and thinking across our curriculum. Problem solving is an integral part of everyday learning. Students are supported with problem solving activities through carefully chosen scaffolds. These scaffolds can be anything that gives the students a structure or outline in order to help the students organise their idea without complete the cognitive work for them. Students should also be expected to justify their answers verbally and through extended writing. Students are expected to present the new information and findings in different ways. When tables are drawn, it is expected that these are drawn using a ruler and pencil. Similarly for graphs, students are expected to use the guidance shared in the calculations protocols and use the correct equipment and paper. Teachers ensure students constructing a graph justify why they have chosen this graph and what the graph shows using technical language. Students are encouraged to restrict reliance on calculators unless it is appropriate to use them. Where calculator skills are taught in Mathematics students are expected to continue using them appropriately in other situations. Students need key mathematical vocabulary and notation to achieve well in exams. Teachers draw attention to these elements in lessons. The consistent approach of key mathematical vocabulary and notation encourages students to apply mathematical skills in other subjects. Teachers are aware of appropriate expectations of students and difficulties that might be experienced with numeracy skills. Staff use agreed calculation protocols and methods for core numeracy skills. Although some students may choose to use other methods, students will be familiar with the methods referred to and should be able to explain their methods of working. Teachers are familiar with correct mathematical language, notation, conventions and techniques, relating to their own subject, and encourage students to use these correctly. Teachers encourage problem solving in familiar and unfamiliar situations. All students participate in solving logic puzzles in tutor time weekly. This is designed to engage, inspire and enthuse students, increasing problem solving for pleasure. The types and levels of difficulty of puzzles change regularly enabling students to develop different strategies and ensure there is sufficient challenge and stretch. Some students will require additional support to develop competent Numeracy skills and remove barriers to their progress. They work on 1:1 basis with our Numeracy support leader. In year 7 and Year 8 we have one lesson per week to support our students to develop their numeracy sills.